Starbird Designs brings you the stunning collection of the Jacobean Hummingbirds designs. This pack includes 10 beautifully designed hummingbirds, each with its own motif and color scheme. With vibrant colors like these, we had to pull out the very best Hemingworth had to offer. 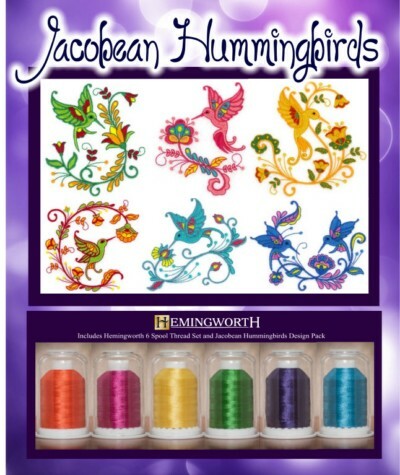 The Jacobean Hummingbird Thread Set includes Fiery Sunset, Fuchsia, Sun, Kelly Green, Royal Purple and Turquoise threads. Together they make an amazing combo.